DETROIT, Oct. 24, 2018 /PRNewswire/ -- The North American International Auto Show (NAIAS) in partnership with Techstars Mobility announced applications for startups to participate in the 2019 AutoMobili-D are now open. Startups interested in applying to participate should complete the startup entry form. Applications submitted before November 16 will receive a discounted rate of $499 versus the standard rate of $999. "The automotive industry is rapidly changing, and startups across the globe are a driving force in that transformation," said Bill Golling, 2019 NAIAS Chairman. "The progress and innovations that stem from within AutoMobili-D's communities are inspiring and proves that AutoMobili-D has been a critical addition to the North American International Auto Show since its inception in 2017." AutoMobili-D is comprised of six communities: connectedCAR, autonomousDRIVING, eMOBILITY, Universities&ASSOCIATIONS, mobilitySERVICES, and smartCITIES. 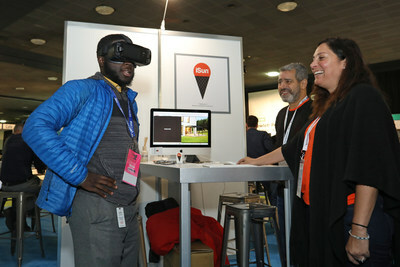 Last year, nearly 200 different brands with 57 startups, in addition to global automakers, suppliers, universities and government organizations. A powerful A-list, including some of the best minds from top universities such as MIT and Carnegie Mellon, participated in AutoMobili-D symposiums and panel discussions. No other event in North America provides an international platform for this vast array of companies, organizations and thought leaders under one roof. "The Motor City is transforming into the Mobility City, and AutoMobili-D is anchoring this transformation," said Ted Serbinski, Managing Director of Techstars Mobility. "Partnering with the North American International Auto Show to bring mobility startups from around the world to showcase their innovative technologies is a driver in Techstars Mobility's ongoing mission to connect the automotive mobility industry to startups. Through AutoMobili-D, we've done just that by facilizing connections and building partnerships at the show." In its 31st year as an international event, the NAIAS is the most influential annual automotive event in the world. NAIAS is where future mobility innovations meet the pavement. With the largest concentration of the world's top automotive and technology executives, designers, engineers and thought leaders, NAIAS serves as the global stage for companies to debut brand-defining vehicles and industry-shaping announcements. NAIAS is unmatched in the industry in presenting six unique shows in one, including: The Gallery, an ultra-luxury automotive event, AutoMobili-D, an inside look at future mobility platforms, Press Preview, Industry Preview, Charity Preview and then concluding with a nine-day Public Show. For more information, visit naias.com. Follow us on Twitter, Facebook and Instagram for highlights and updates.